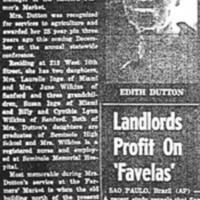 Newspaper article in the The Sanford Herald on the retirement of Edith Dutton in 1968, secretary to the manager of the Sanford State Farmers' Market, after 28 years of service. Microfilm of original newspaper article: "Farmers' Market Aide Retires." The Sanford Herald, September 4, 1968: State Farmers' Market Collection, Museum of Seminole County History, Sanford, Florida. Original newspaper article: "Farmers' Market Aide Retires." The Sanford Herald, September 4, 1968. Digital reproduction of microfilm copy of newspaper article: "Farmers' Market Aide Retires." The Sanford Herald, September 4, 1968. The Sanford Herald, September 4, 1968. The Sanford Herald, September 4, 1968, page 8A. Originally owned by The Sanford Herald. First rest and back to work in civic activities and "all the other things I've wanted to do and couldn't over the past many years" are on the agenda for Mrs. Edith M. Dutton, who is retiring after 28 years service as secretary to Leo Butner, manager of the Sanford Farmer's Market. Mrs. Dutton was recognized for services to agriculture and awarded her 25 year pin three years ago this coming December at the annual statewide conference. Residing at 213 West 16th Street, she has two daughters, Mrs. Laurelle Inge of Miami and Mrs. June Wilkins of Sanford and three grandchildren, Susan Inge of Miami and Billy and Cynthia Lynn Wilkins of Sanford. Both of Mrs. Dutton's daughters are graduates of Seminole High School and Mrs. Wilkins is a registered nurse and employed at Seminole Memorial Hospital. Most memorable during Mrs. Dutton's service at the Farmers' Market is when the old building north of the present facility burned to the ground on Apr. 4, 1957. The new building was erected almost immediately and dedicated in October of the same year. Only two commissioners of agriculture were in office during her long service, Nathan Mayo and the present one, Doyle Connor. Mrs. Dutton plans in 1970 "Be the Lord willing" to go to Kansas and attend the 50th year alumni celebration at Seneca High School. “Farmers' Market Aide Retires.” RICHES of Central Florida accessed April 23, 2019, https://richesmi.cah.ucf.edu/omeka/items/show/1152.